Where Is The Kerch Strait? The Kerch Strait connects the Black Sea and the Sea of Azov. The Kerch Strait in Russia. Editorial credit: Popoudina Svetlana / Shutterstock.com. The Kerch Strait is a connection between the Black Sea and the Sea of Azov. It also separates the Kerch and Taman Peninsulas. This stretch of water has a width of 3.1km (1.9 mi) at its narrowest point and 15km (9.3 mi) at its widest point with a depth of 18m (59 ft.) The strait gets its name from the harbor at Kerch. The passage is about 35km (22 miles) long and separates an eastern extension of Crimea from Taman. It seems like there were islands formed by the Kuban River but they have silted up. Romans identified the channel as Cimmerian Bosporus as a way of honoring the Cimmerians. The Second World War exposed the Perch Peninsula to fights between the Soviet Army and that of Germany. The coolest months of the year offered a better battleground for the troops, this is because the soldiers could easily walk over frozen water. In early 1943, Hitler gave an order for a 4.8-km (3.0 mi) road/railway to be built traversing the strait in order to better attack the Caucasus. Railway service became functional on 14 June 1943, it had a transport capacity of a thousand tones. This limitation meant that the transportation could only take care of the defensive requirements of the army that was based in Kuban. Recurrent earth shocks in the region required that the bridge be supported by extra strong steel girders, but the transportation of the girders would hinder the transfer of military supplies to Crimea. This setback put a stop to the construction in 1943. The Soviets attempted to bridge the strait by building a provisional bridge in 1944 which was later destroyed by ice flows in February of 1944. There was been a territorial conflict in the region featuring the Tuzla Island between Russia and Ukraine in the year 2003. On 11th November 2007, a very bad storm struck the Black sea, sinking 4 ships, running another six ashore and destroying two tankers. These accidents led to a big oil spill of at least 2,000 tons of fuel and the demise of 23 sailors. A ferry service was established n 1952 to connect Crimea to the Krasnodar Krai. Originally, the strait had 4 train ferries which were later supplemented with 3 car ferries. The train transport was used for the next 40 years until they became outdated in 1980 and removed from operating. They were later upgraded and reintroduced in 2004. The government of Russia is building a bridge traversing the strait. The plan is to have it completed by the year 2019. 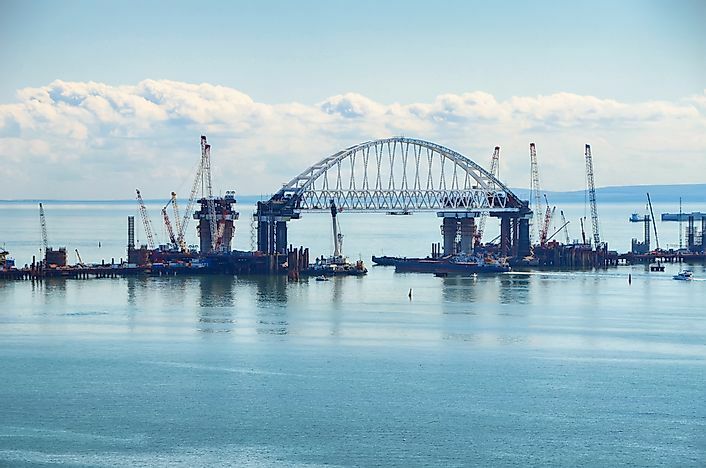 The construction of this bridge has been beneficial to the marine life increasing the food supply in the water which has attracted a lot of fish and a huge number of the threatened Black sea Bottlenose species of dolphins. The Kerch Strait is very shallow in some points which hinders passage of big vessels. For this reason, the Kerch-Yenikalskiy canal was built on the channel. The canal can support vessels of up to 215 meters long with a draft reaching up to 8mwith mandatory pilot help. Where Is The Strait Of Makassar?